Halloween’s always a great excuse to cut loose and enjoy yourself. 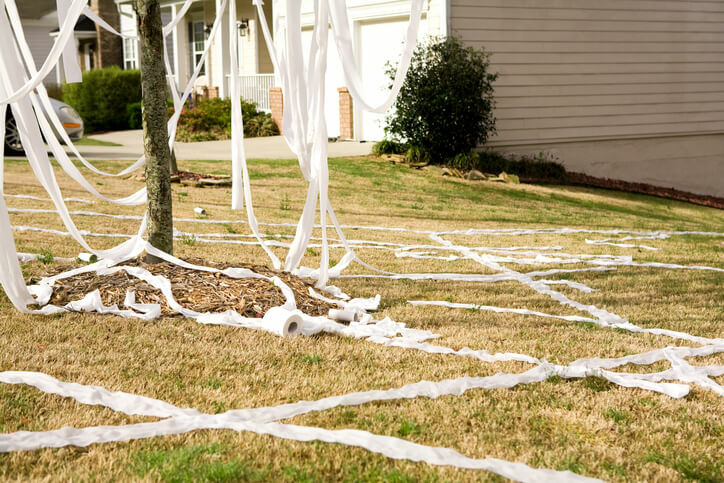 But while it’s always been a night of scares and trickery, you might want to think twice before planning any Halloween pranks: Egging your cranky neighbor’s house when you were a little kid might have been fun (for you, at least). But trying to pull this off as a bigger kid—or worse, as an adult—could get you in trouble with the law. In Florida, vandalism, also known as criminal mischief, is defined as willfully and maliciously damaging another person’s property. Penalties for vandalism vary with the amount of damage caused. Acts of vandalism resulting in under $200 of damage are considered second-degree misdemeanors and can result in up to 60 days in jail, up to six months of probation, or fines up to $500. On the other end of the scale, causing more than $1000 of damage is considered a third-degree felony. If convicted, you can face up to five years in prison, up to five years of probation, or a fine of up to $5000. In short, that “fun” little prank may end up not being much fun for you after all. And even a juvenile vandalism charge can have lasting consequences—for instance, it can impact your chances of college admission, and not in a good way. First, if you find yourself facing a vandalism charge, it’s crucial that you get qualified legal help immediately. If you’re in Gainesville, call Adam Stout to ensure you get the strongest possible defense. Your options for fighting back will vary depending on the circumstances of your case. And every case is different, which is why you need an experienced criminal defense attorney to guide you through the process and identify the best defense strategy for your situation. Adam Stout has experience as both a defense attorney and a prosecutor, so he knows how both sides think. If you’re facing a vandalism charge, call Adam Stout to ensure you get the solid defense and strong support you deserve.